otherwise. A dog being out and about in public is so prevalent that at my favorite restaurant they even have a “dog’s menu” underneath the children’s menu. Could this difference in policy actually be a difference in behavior? While I have seen no evidence whatsoever to convince me that French children behave better than children of any other nationality (sorry, I’m sure I’ll get skewered for this since it is all the rage…but there it is…kids are kids the world over and I see just as many crying, screaming temper tantrums in public here as I have in any other country I have lived in) I WILL say that their dogs are appear to be more attune to social etiquette. about town seemed to be much better behaved. They sit patiently if left outside a “magasin” without barking or putting up much of a fuss, while giving imploring looks they do not incessantly beg at restaurant tables, and they typically manage to “do their business” in the “espace chiens”* set up around town for this express purpose. And so, the question is: Are these better behaved dogs or are they just French? Let me explain by going into dog psyche for a moment. A French dog is out and about in town with his owner. This is the dog’s internal dialogue. Pfff…look at that stoopeed bichon on a leash…so degrading. I mean, you know, you should learn how to walk if you want to go out in public. Well, it is hardly a wonder, huh? The owner is wearing tennis shoes and MON DIEU picking up the poop off the sidewalk! If my owner did this I would run away; I would rather live on ze street zen with a human who would disrespect themselves so. It would be too shameful. Picking up poop…it eez disgusting, non? I don’t walk on leashes and I manage to get to a toilet when nature calls, huh? I’m not a barbarian or an American…ha…Americans. The owner stops in front of a bakery and leaves the dog waiting outside with another one. Our narrator dog stops and looks around for a minute. A la la la la…what is thees barking fool next to me? Last week I was walking back home from the bakery with my baguette in hand. As some bakeries prefer, the baguette wasn’t even fully enclosed in a wrapper but just had a wisp of paper for me to hold it around the middle. As I was walking back to my house the baguette was down by my side…you know, about dog height…and a dog came walking by with his owner. The dog didn’t so much as turn his nose in the direction of my baguette. It made quite the impression on me that the dog didn’t even make an attempt; there was no tug of war with the owner pulling him back from trying to devour my baguette. I thought to myself what a well-behaved canine he was but then again, the dog was French so maybe my baguette was just from the wrong bakery. 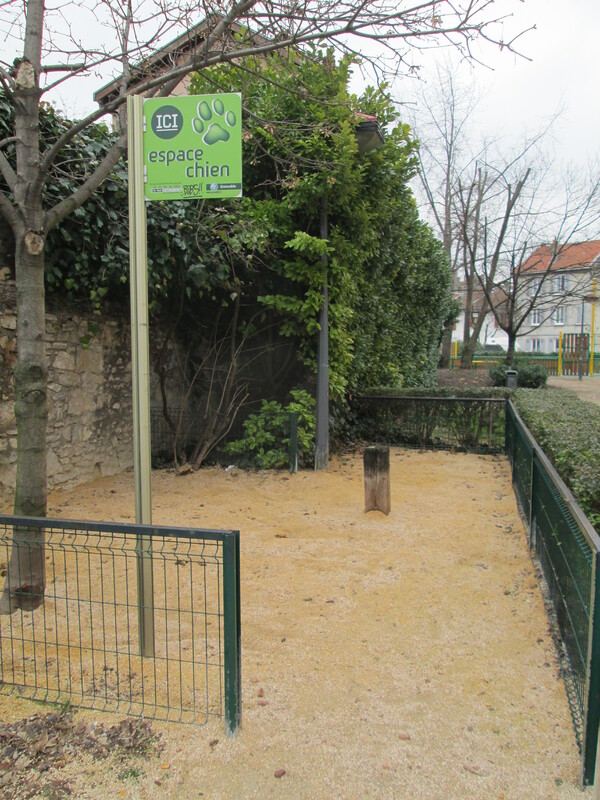 *The Espace Chiens are set up around the city and are little sandy or dirt pits (sort of like sandboxes) with some fencing around them for the dogs to do their business. 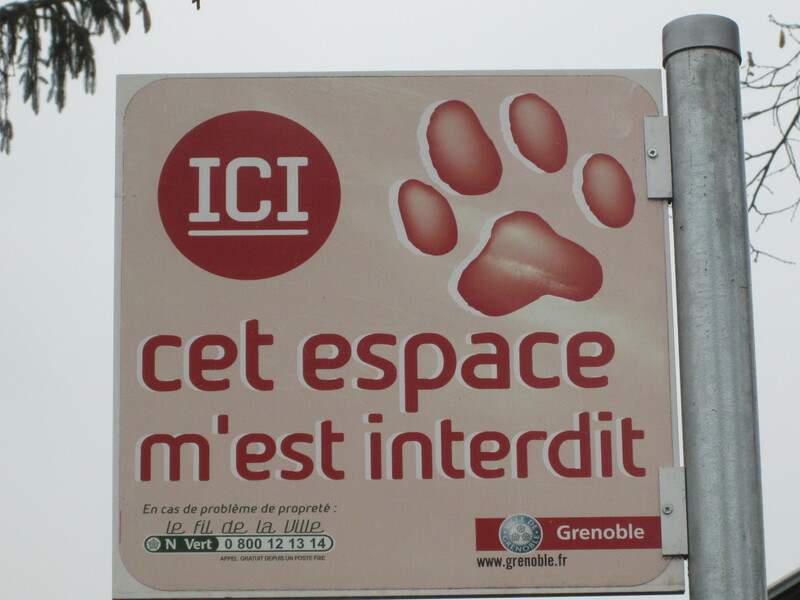 Yes, that is right, in France dogs have their own public toilets…gotta love it. Furthermore, while these “espaces” are used regularly there is still a prodigious amount of poo on the sidewalks. When you walk around France it is best to keep an eagle eye. I have decided that it would be hysterical to have my own English subtitles, you know, just a little screen in front of me to translate what I say in French into English. Mind you, this would not be to help other people understand me, but so that I could see what it is that I am actually saying. Lately, I have become more confident in my abilities to speak French (generally fueled by one of those extra-long aperitifs). I speak rapidly and say multiple sentences at a time. I do that whole “thoughtful pause” that foreigners always do that makes them look so casual and smart as they try to find the right word to use. All in all, I look like the super-cool, multi-lingual expat…as long as you don’t speak French. I remember going to Costa Rica with a friend of mine a few years ago. Her family is Costa Rican but she was raised in the U.S.
“Wow,” I told her. “Your Spanish is so good!” To me she sounded like a local. For example, I know the word for “good” and I know the word for “walk” but I didn’t know that when you put them together they don’t mean “good walk” but instead mean “cheap”. These types of little confusions combined with my tragic pronunciation are why I often find myself staring into the baffled faces of French people. They try to be nice and pretend they know what I am saying, but having been the foreigner for so long, I know what those smiling nods mean. “So, you love American food?” I will ask in French. “Oui, absolutement” they will reply, giving me an encouraging smile. DOUBLE BUSTED! Come to think of it, this could become a rather entertaining little game. But then again, is it such a bad thing for people to placate you? Is it so horrible that they want to encourage instead of discourage? It’s good to be given some motivation to keep trying, to have people pretending through the sentences they don’t understand so that they can piece together the ones that they do. Of course, it would be nice to know whether I am asking if they enjoy the flavor of the fromage or if I am saying “happy chicken can you monkey dance a cheese”; but I guess I’ll just have to wait for the subtitles. *Not only would a French person never say that they loved American food, they would be utterly confused as to what was meant by American food. My repeated experience has been that most of them think that everyone in America eats cheeseburgers three times a day.